This is a delicate looking but reliable epidendrum species native to Brazil and Paraguay. It flowers as a small plant but over time develops into a tall reed stemmed plant with keikis (small growths on larger ones) that result in a bush like habit. The species is a terrestrial but we grow it in just the same way as our epiphytes in pots of bark based compost and the plants seems to do well grown vertically with the help of support or horizontally/pendulously if allowed to dangle about. 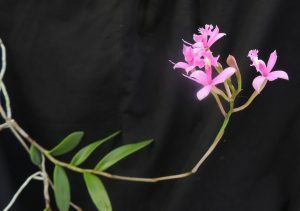 In Costa Rice we have seen reed stemmed epidendrum species that use their growth habit to sprawl up through scrub to reach the light and to present their long flowering sprays to their butterfly pollinators. This a very rewarding plant to grow as plants flower for many months with a succession of flowers, and propagation by pulling off the keikis once they have a good root system is straight forward.